We explored JiuHuang Stream on a cloudy day with some sunshine. 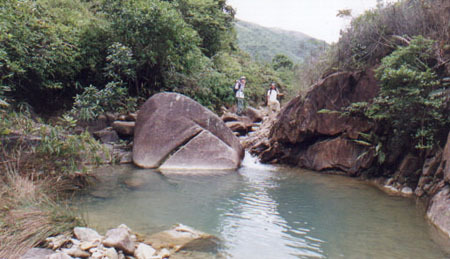 First, we trekked along the hiking path to the starting point, Wong Nai Tun Reservoir(JV926802), which is north to Tai Lam Chung Reservoir in northwestern New Territories. We found the entrance of JiuHuang Stream. And we started our journey. 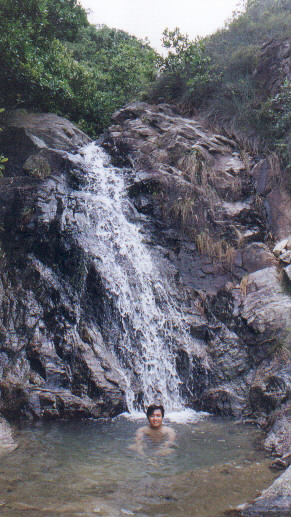 The first scenery was situated at an altitude of about 200m: It was a 3-consecutive falls. At the altitude of 230M, we met the first big pool. The pool was big enough for a swim. But we recognized that the water was not very clean. So we chose to climb up instead after a brief rest here. 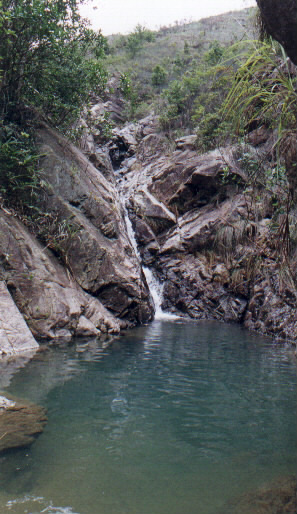 During the climb, we were excited by seeing a moderate sized waterfall. The water was much cleaner, probably because of a rapid flow. There were two branches after passing the pool. We chose the left sided one where there was a fall. You may like to soak yourself there, too. Then we arrived at the altitude of 280m, where there was obvious hiking path for you to walk. We did not follow it, but instead we climbed up the hill and trekked to meet another stream (the side branch of Dan Kwai Stream 丹桂坑石澗). You will appreciate our route on the map. 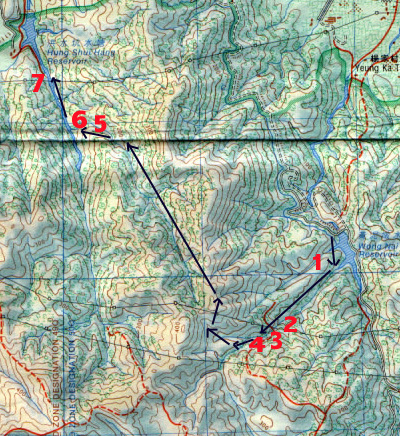 You may find that there is no hiking route on that map. Actually there was a very hidden secret path accompanying the stream (on the right sided if you walked downwards). Warn you: the route was quite disgusting, you will be scratched repeatedly by the condensed grass and woods. We walked along the hidden walking path till the altitude of 170m. Then we entered the stream with a wide feeling. 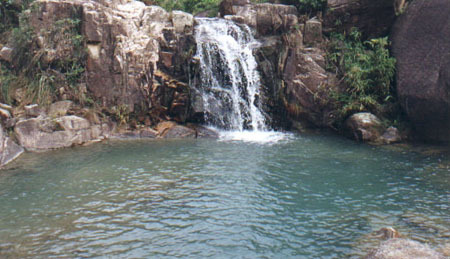 It was a leisure walk where there were pools and small falls. 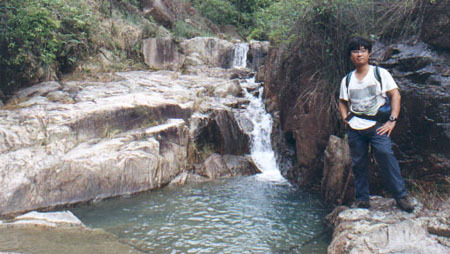 At the altitude of 130m, there was a big pool where this stream met Dan Kwai Stream. Don't miss the chance of having a swim there. The water there was clean and there was also fish in it. 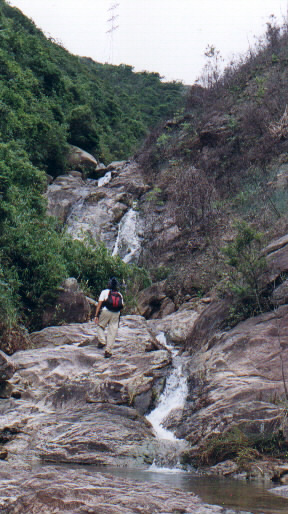 Trek downwards and you will notice a very big water collection at the lower end of the stream (altitude 100m). It was actually the dam . Don't swim in it, otherwise you may be sued. Go on right side in the woods region, then you find your way to cross the dam . There is a walking path afterwards. 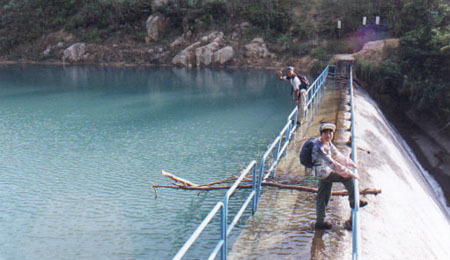 You will pass Hung Shui Hang Reservoir(洪水坑水塘) which the stream flows into. You will also see a Quarry when you left.